Benjamin Mendy may be sidelined for months after suffering a cruciate ligament injury against Crystal Palace, but you can’t keep the smile off his face. The 23-year-old left-back was all smiles when spotted going to the Quiron Clinic in Barcelona for rehab, despite being on crutches with his damaged knee heavily protected. According to the Daily Mail, Mendy smiled for photos but was seen grimacing later on at pain in his knee, and it will be a long road back to action for the Manchester City star. 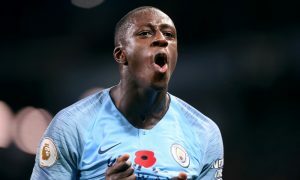 An exact return date is impossible to predict at this point, with Pep Guardiola estimating Mendy would return around the time of the UEFA Champions League semi finals in April. With the expertise of the famed Dr Ramon Cugat, City will hope Mendy’s recovery can be sped up and that he can play plenty of football before the season ends.